Lakeview Backpackers i Johannesburg, Sydafrika: Reservér nu! 50% of the balance is non refundable in case of cancelation or reduction in numbers. 50% security deposit is required for groups staying more than 1 night. Lakeview Backpackers is under new management. We have a nice outside pool and BBQ area where you can relax, overlooking the lake. The large kitchen is fully equipped and the lounge and dining room is spacious with comfy couches and satellite TV. All tours from Soweto township tours to Kruger Park camping can be arranged for you by the staff. We offer all you need to set you up for traveling in Southern Africa. The property is located in a peaceful residential neighbourhood overlooking a lake. 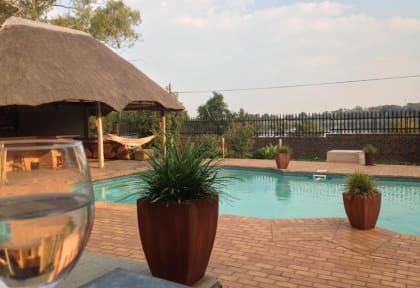 Only 5 km from OR Tambo International airport overlooking Blaaupan lake and bird sanctuary, it feels like your close to nature but still near the city. Shops, restaurants and bars are 1km from the the hostel Lakeview Backpackers. We offer a range of rooms - from dormitory to single, private double or twin rooms. Towels and linen are provided. We also offer free WiFi that covers most of the property. Families and children are more than welcome at Lakeview Backpackers. Families and children are more than welcome at Lakeview Backpackers.